Battery left and right earphone all is 50mAh rechargeable Li battery, Charging box battery capacity 950mAh. 2. 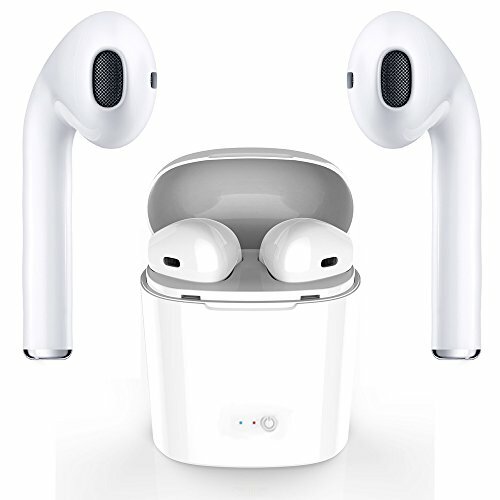 Double click on any one of the earbuds to enter pairing mode, wait for them to sync with each other, and there will be a voice prompt "Your headset is connected" when successfully synced. 3. Turn on Bluetooth on your device and search for "HBQ i7S" to connect. When connected, the headset's blue light flashes blue slowly. 【HANDS-FREE CALLING】- With Bluetooth v4.1 wireless technology the earphone set is quickly paired with any smart phone and any other Bluetooth device. 【HIGHLY COMPATIBLE】- Compatible with most Bluetooth enabled devices, such as iPhone 7 6S 6 plus, LG G5 G4 G3, Samsung Galaxy S7 S6, Huawei, iPad and other Bluetooth enabled devices. 【PORTABLE DESIGN】- Package comes with a delicate charging case, you can charge your earbuds anytime anywhere. 【1 YEAR WARRANTY】- Enjoy the most trustworthy 12-month warranty with your wireless headphone, We'll provide you return/replacement service if you are not satisfied. If you have any questions about this product by GJFeng Tech, contact us by completing and submitting the form below. If you are looking for a specif part number, please include it with your message.